There are advantages to having gone to a military boarding school for your high school years. After four years in a military school, college, even an ivy league one, can only be so much of a challenge. Though my time at McCallie was only four years, there are some things that have stuck with me. You just can't sit in the chapel that many times without something sinking into your head. Even a bunch of teenagers can't be immune for four years. McCallie's motto still is “Man’s Chief End is to Glorify God and to Enjoy Him Forever.” It would be hard to come out of McCallie without a strong appreciation for religion. You couldn't graduate without a year of Bible. There are other things that were drummed into my unreceptive teenage head. Most importantly I remember, "Honor, Truth, and Duty. I also learned the importance of getting a job done, and the life altering lesson that you are responsible for your own actions. I can still remember getting up at 5 am and studying Latin in the hallway with a flashlight. It took me a long time to get over black socks and shining my shoes each morning. Of course I still like blue shirts, maybe that goes back to the choice of wearing a blue or a blue shirt unless you were wearing dress whites. Like many McCallie graduates I was really ready to leave and to have the opportunity to enjoy some freedom. The year we left, 1967, was the last year for McCallie's military program. I'm not sorry I went through it, but I also believe that being a military school got in the way of McCallie's main academic and spiritual mission. However, thanks to all the training including the military part of it, I knew how to buckle down when I faced a job that needed doing. Many college students didn't have the discipline to stop partying. There's one thing that I learned which has proved invaluable throughout life. That would be the ability to take a nap while appearing to be wide awake. Now age might dampen the skill a little, but it's still useful. After all those years in a Presbyterian influenced military school, it was natural to end up in a Presbyterian Church. The fortunate part is I've heard one of our ministers say that he feels honored that people are comfortable enough to take a little nap or rest their eyes in his church. With my McCallie honed skill he might never know when he's being honored. Well, when searching for 'pics' to put on my 'family webpage' I came across this site. Your comments on McCallie and it's attributes couldn't be MORE true. I'm feeling a bit 'glum' today though as my son graduated yesterday from there - a member of the Class of 2008. Although we sat at the graduations for many of the past 5-6 years, this was the hardest I guess. Or most 'surreal' I should say. It seemed as if it would go on forever. But, the school was more than a 'military school with a bible class' - the Honor, Truth, Duty you mentioned was so true. Our last son through there - has always been the 'fun' one in our family - but last year - got involved in a boy prank that at any other school would have been seen as nothing. But, there - it was punished - probably more severely - but then a followup by adults there - to help him 'redeem' himself - was great. He now heads on to college with probably close to a year of college AP credits and he will flourish there I'm sure - because he has learned so much about himself and the world. Our older son - has gone on to do more great things also and continues to hold tight to the things reinforced at McCallie - gosh - I am unsure that I could do the school justice. It's new (well - close to 12 years old now) Honors Program - started by past McCallie Men with such vision to enhance the school and it's attributes. It has given lots of 'not rich' kids a chance at a high school experience that could just not be matched anywhere - at least that is our feeling. Our oldest was involved in so many aspects of the school as well as being a school athlete. Our second one - took less 'chances' there - but was also a varsity athlete and still has learned so much about himself. So, what do you do when you are a parent and leave there? You just thank your lucky stars EVERY day that McCallie came knocking and asked your son to come to their campus. It was a dream come true for them both and they are now "McCallie Men" - we are so proud! Honor Truth Duty - words to live by. Honor, truth, and duty have been very good companions throughout my life. While they kept me headed down a path that might not be popular with corporations, I generally sleep well at night. I would love to see a few corporations embrace the moral high ground, but I am not holding my breath. McCallie's motto is its own reward. I also can look people in the eye and not have to worry about keeping my story straight. You might enjoy this post. Your comments about McCallie are certainly true. I loved every moment of it and attribute my rich and interesting life to what I learned at McCallie. For a boy like me who was not good at athletics, the military program gave me an oppportunity to excel. On my way to becoming commander of the first battalion, I learned the value of working very hard and concentrating on getting a job done well. The academics were always challenging and the four years of required Bible gave me a knowledge of Christianity that I have never regretted. Most of all, I learned the importance of personal integrity. 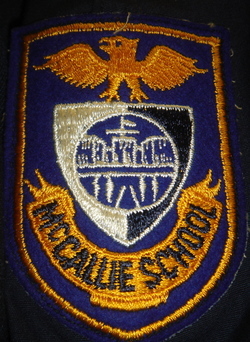 My teachers and my friends at McCallie were the best that I have ever had. I cannot thank them enough. In the near future, maybe you'll think of sending your kids in one of those military schools around your area to experience the same kind of education and training which you got during your school years.